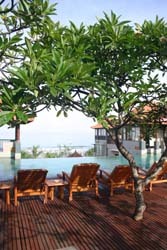 The Mercure Hotel is located at the south end of Legian beach, just off Kuta Square. The hotel is right across the road from the popular surfing beach, and conveniently located for dining and shopping. The Mercure is just four stories high, with most rooms along the exterior wall, off a central courtyard with a garden and ornamental pond at the ground. The design is sort of Balinese modern. 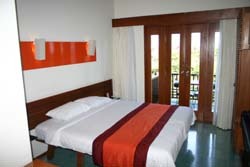 The rooms are likewise designed in a simple modern style. Floors are tile and stone, rather than carpet, but this is very practical for a beach front hotel, and the floors can be quite cool when it's hot outside. The bathroom of my superior room was very large indeed, with a large window above the tub. Curiously, the hotel pool was located on the fourth floor. It isn't very deep, but its 'infinity' design allowed people to relax in the pool while looking out at the ocean below. Hotel facilities include two pools (one a splash pool for children), spa and restaurant. A shopping arcade on the ground floor also houses a surf school. Rooms feature air conditioning, hot and cold water, mini-bars, complementary coffee and tea, color televisions (many channels), hair dryer and IDD telephones. Rooms at the Mercure Kuta Hotel may be booked through Agoda, or use Hotels Combined to compare rates for the resort from dozens of online booking sites.